Not a Fan: Chapter One: D.T.R. This seems like a simple and easy enough question. Most of us reading this blog wouldn’t even pause to consider the question before blurting out our answer. But, maybe, just maybe, it is not as simple and easy as we make it out to be. Over the next few weeks as we review Not a Fan by Kyle Idleman, I want you to really take the time to ponder this question. 2. The “Why is there a fish on the back of my friend’s car” group. 1. The “Jesus Fish on the back of my car” group-as you can guess, this group is those of us who call ourselves Christians. Many of us would go a step further and call ourselves devout Christians or “Jesus freaks.” When asked this question, most of us (yes, I am proclaiming to be in this group) would quickly answer “of course.” We assume that because we go to church and say we believe in Jesus Christ that we are indeed followers of Jesus Christ. But are we really true followers? To some, this may seem too flippant. To some, it may seem that Kyle is lacking in the love department. However, I warned you (and so did he) that he was not going to sugarcoat things. There comes a time in your walk with the Lord that you go from eating baby food to solid foods. There is a time we must grow up and grow in Christ. Not everything Jesus had to say was warm and fuzzy. There are many hard lessons for us. There are things we will be asked to do that we don’t want to do. There will be things we don’t understand and do not think is fair. However, if we want the best God has for us, we have to follow His ways. It is clear to me that not everyone who says they believe in Jesus Christ will enter God’s Kingdom. It comes down to who has a relationship with Jesus Christ. We can follow all of God’s laws and will for our lives, but if we don’t have a relationship with Jesus, all of those works will be in vain. On the flip side, we can say we believe in Jesus, but if we live our lives any way we please and don’t know Jesus or Jesus doesn’t know us, neither will we enter the Kingdom of Heaven. I would propose this blog series would do the same (for those not following along in the book). 2. The “Why is there a fish on the back of my friend’s car” group-this group would consist of those who either are not sure about Jesus or do not call themselves Christians. It is not that they are necessarily opposed (but some are very much opposed); they just do not understand all the hoopla surrounding this guy named Jesus. It is kind of like my friend Jen’s obsession with Star Wars: I have no idea what she is talking about, I don’t get it, not at all, but if she likes it, then whatever. If you are in this group and are reading my blog, I am thankful and glad you’re here. I would also be lying (through omission) if I didn’t say I was surprised. Not too many “non-Christians” would take the time to read a blog of this nature. But, once again, I am glad you’re here and I pray that you continue on. If you are among those who adamantly oppose Jesus and all he stands for, don’t worry neither Kyle or I plan to “win” you over, I just ask that you be respectful in your comments and continue to read on. “Would you pause for a moment and ask yourself, What if all life comes down to this one question (Am I follower of Jesus Christ?)? What if there really is a heaven and there really is a hell, and where I spend eternity comes down to this one question? ….I believe that the reason we were put on this earth was to answer this question. And the truth is, whether or not we do so consciously or intentionally, we all answer this question. I want you to know up front that I’m not here to “sell” Jesus. I’m not going to try to talk you into falling Jesus by presenting the parts that are most appealing. Because here’s the thing, and don’t tell the people in Group #1 I said this, but many of them assume they are followers of Jesus, but the truth is they have never heard the unedited version of what Jesus taught about following him. It doesn’t really matter which group you fall into. The only thing that matters is the answer to that question. Remember from Matthew 7, that not all who call upon His name will enter into heaven because they do not have a relationship with Jesus Christ. For all of us feeling comfortable in group one, many of those turned away will be those who call themselves “Christians.” What group do you think he was talking to at the time of that message? Well, non-Christians certainly wouldn’t be prophesying and casting out demons in the name of Jesus! “In your mind picture yourself walking into a local coffee shop. You grab a snack and get a drink and then walk towards the back where it isn’t crowded and you find a seat at a small table. You take a sip of your drink and enjoy a few quiet minutes. Now, imagine that Jesus comes in and sits down next to you. You know it’s him because of the blue sash. You’re unsure of what to say. In an awkward moment you try to break the silence by asking him to turn your drink into wine. He gives you the same look he used to give Peter. Before he has a chance to respond, you suddenly realize you haven’t prayed for your food. You decide to say your prayer out loud, hoping that Jesus will be impressed. You start off okay, but understandably you get nervous and pray, ‘three things we pray: to love thee more dearly, to see thee more clearly, to follow thee more nearly, day, by day, by day.’ You quickly say ‘Amen’ when you realize you‘re quoting Ben Stiller’s prayer from Meet the Parents. Before you have a chance to make things more awkward, Jesus skips the small talk and gets right to the point. He looks you in the eye and says, ‘It’s time we define this relationship.’ He wants to know how you feel about him. Is your relationship with Jesus exclusive? Is it just casual weekend thing or has it moved past that? How would your relationship be defined? What exactly is your level of commitment? Whether you’ve called yourself a Christian since childhood, or all of this is new to you, Jesus would clearly define what kind of relationship he wants to have with you. He wouldn’t sugarcoat it or dress it up. He would tell you exactly what it meant to follow him. As you are sitting in the coffee shop listening to Jesus give you the unedited version of what kind of relationship he wants with you, I can’t help but wonder if that question, ‘Are you a follower of Jesus’ would be a little more challenging to answer. And that is where we will leave off for today. Join me Monday as we take a look at the differences between a fan and follower of Jesus Christ. Hi. Thanks for visiting my blog. I’m glad you did because it led me here. I enjoyed reading the two posts you’ve done for this book and I’m looking forward to the rest. It’s very nice to meet you. God bless. Thank you Jennifer for your kind and encouraging words. I am excited about this new series and Not a Fan is one of my favorite Non-Christian books of all times. I just love sharing books that are filled with wisdom beyond me. God bless! 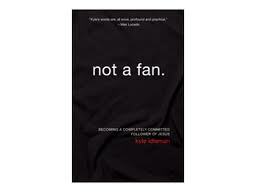 Next Next post: Beyond the Book Review:Not a Fan: Fan or Follower?